When deciding how to track the location of the pitches to be caught, I was considering two options, neither of which really seemed completely appropriate. With help from Mike Fast I was able to calculate the spot where every pitch would have landed had the ball traveled untouched until it hit the ground. 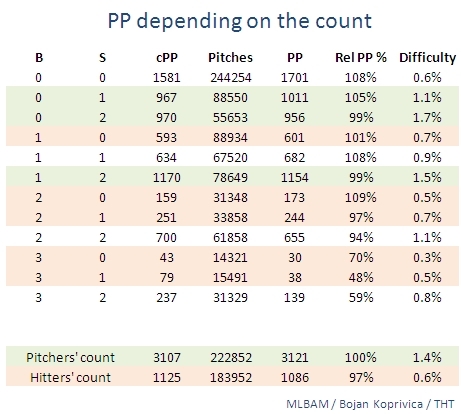 While this was really helpful for pitches that clearly landed in the dirt in front of the catcher, it gave us only obscure information about the rest of the pitches. Is a pitch that would otherwise land 40 feet behind the catcher easier or harder to block than the one that would land 30 feet behind him? And if two pitches both land 40 feet behind the catcher, do a curveball and a fastball cross the plane where the catcher is placed at the same height? On the other hand, the PITCHf/x data offered the height and the width of every pitch as it crosses the front edge of the plate. This leads to similar problems. First, the catcher finds himself several feet behind that plane. Second, the balls in the dirt are represented with the negative height number, again leading us to guess where they bounced. Discussing these issues with Tom Tango, it became clear that if we want to model reality, we have to make the model as real as possible. In this case it meant working in three dimensions and using both the horizontal and a vertical plane, the former for the pitches that usually bounce in front of the catcher and the latter for those that don’t. I placed the vertical plane three feet behind the back edge of the home plate, because that is where I expect the catcher’s mitt to be most of the times. You might or might not agree with this. I don’t think there is a singular correct distance from the plate that can be always used, as some catchers position themselves deeper than others and they also adapt to the batter positioning himself in the batter’s box. Generally, they try to move as far ahead as possible without interfering with the swing. The letter C in the above graphic is placed just about three feet behind the back edge of the home plate. And although the angle on the following shot of Yadier Molina doesn’t show great perspective, I think it can be assumed that his glove—not his body—is just behind the end of the batter’s box. For sure, some of the pitches that would touch the ground a bit more than three feet behind the home plate will not be caught in the air. Similarly, some of the ones that would bounce just a bit in front of that imaginary line will be caught on the fly. As we are not dealing with the binary model here, it doesn’t really matter all that much. In a nutshell, we see that pitches that bounce are harder to block than the ones that don’t and that pitches further away from the center of the plate pose more problems for the catchers than the ones which are over the plate. Incredible, right? Still, this kind of data presentation made it easier for me to visualize the certain areas where catchers have to receive the pitches. * In addition, I decided to ignore all the pitchouts and intentional balls, although PP can occasionally happen on such pitches. The price of losing a few passed pitches seemed acceptable when compared to the danger of seriously skewing the data by including them. 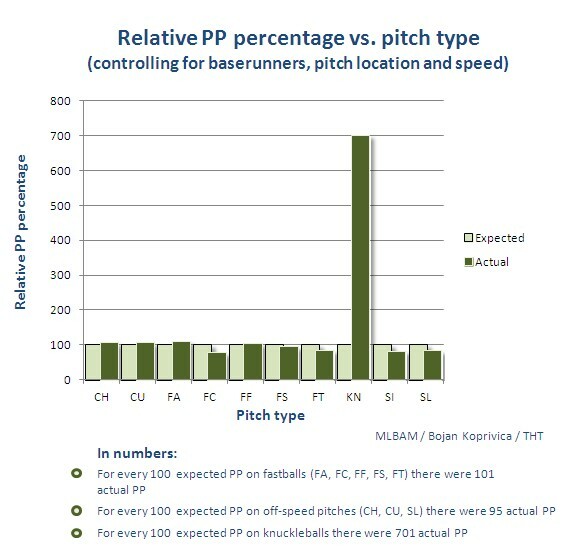 I first looked at the PP dependency on pitch length/height. 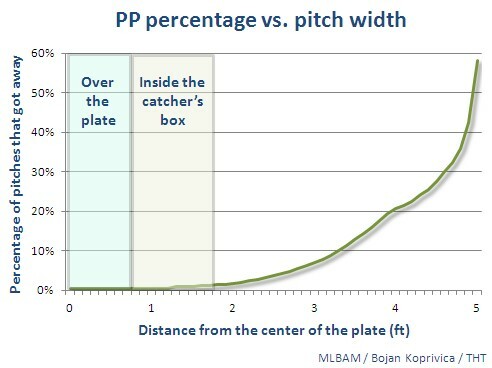 From the model above, the “length” of the pitch is the distance between the spot where the pitch bounced and the catcher’s plane. It is represented with a positive Y number. 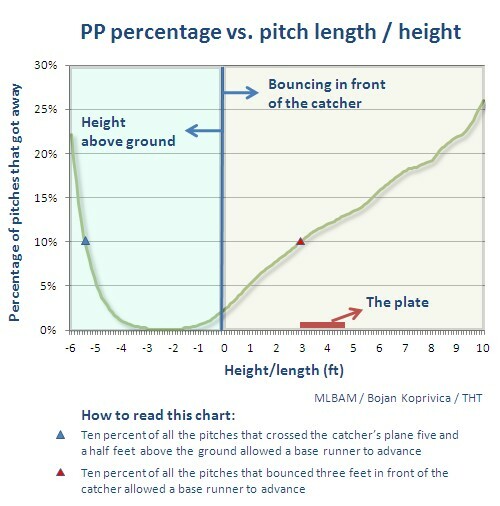 The “height” is the distance above ground at the catcher’s plane for the pitches that didn’t bounce. It is represented with a negative Y number. * As I mentioned above, I ignore intentional balls and pitchouts. When I don’t, it looks as if a ball four to five feet off the plate is easier to catch than the one three feet off. Three more factors come into effect regarding pitch width. The batter handedness is one and it is basically a disturbance factor. The pitches inside are harder to block than the ones outside because the catcher has the batter and his bat to deal with and to obscure his vision of the ball. The other factor is that the width of the pitch doesn’t seem to matter the same on different lengths of the pitch. A pitch that is a foot away from the center of the plate will not increase the chances of a PP by the same rate when it is in the dirt as it will when it is belt high, so I had to use multiple regressions. And, finally, the center of the plate is not the easiest place to catch the ball, but rather a spot about half a foot to the left of it, as seen from the catcher’s perspective. I assume it has something to do with the fact that all the catchers are right-handed. 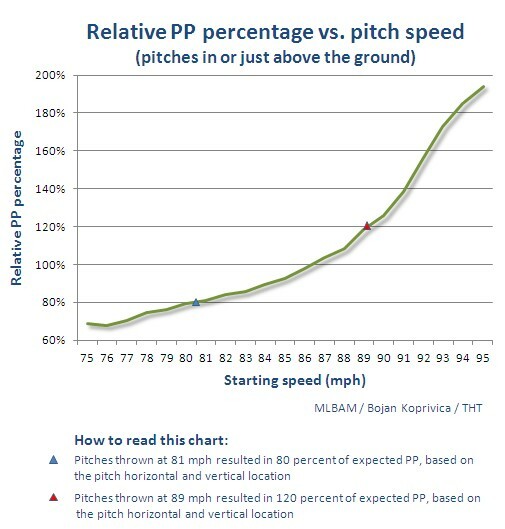 As for the pitch movement, I saw some correlation between vertical movement and PP percentage on the balls in the dirt, but that mostly came by the way of speed correlation (faster pitches generally had more vertical movement). Horizontal movement did not seem to affect the probabilities on the short pitches, but showed some correlation on the higher ones. I decided against incorporating both of them into the model, as the correlations seemed inconclusive. These are rather small samples, but that’s all we have (we’ll get to what the numbers mean in a second, for now it’s enough to know that numbers in the last two columns are bad when negative and good when positive). 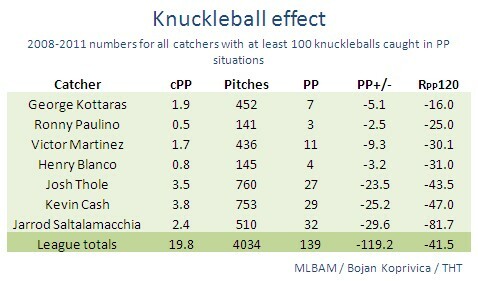 Every catcher performs worse against a knuckleball, but Saltalamacchia seemed to do an even poorer job than the rest of them. 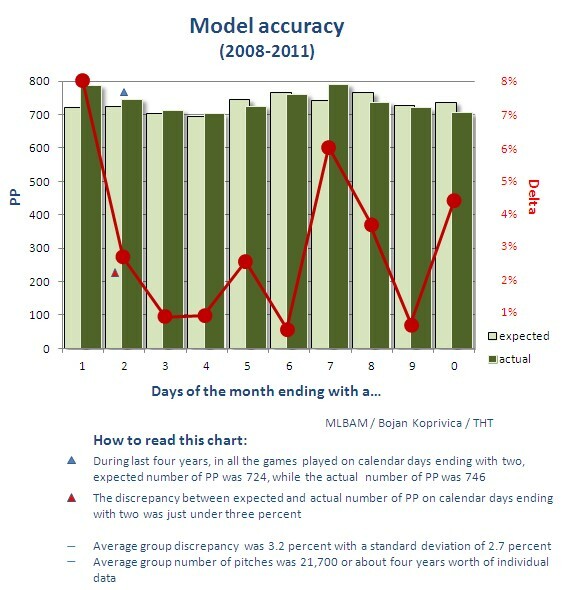 Scoring from third and reaching first happen less often than the model predicts, while advances to second and third are more likely than what is calculated from other factors. It makes sense, too. Second base means the longest throw, and while first and third are equally far away from the catcher, the big difference is in getting the jump. The runner from second already has the lead and has nothing to worry about but running. The batter who just struck out might not even realize he has a chance to run until it’s too late. The only explanation I can come up with is hit-and-run. The runner is being sent, the batter protects and swings at the bad pitch, the ball rolls away from the catcher. 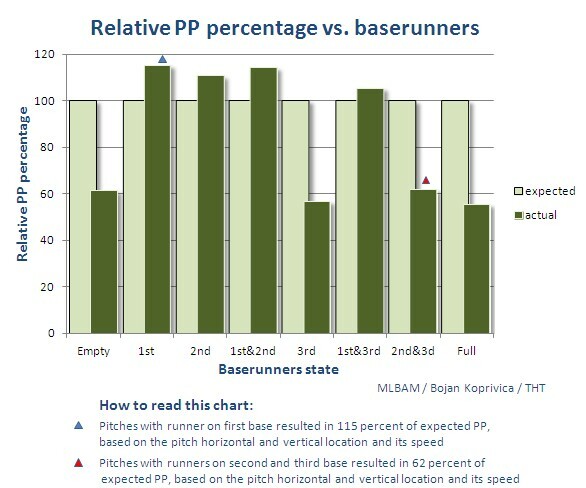 The runner from first would have made it to second anyway, but due to the fact that he started prior to the pitch, his advance is being credited as a stolen base and not as a variety of a PP. I let this one just be. I thought of using the day of the week, too, but I was afraid I could run into a replacement-catcher-on-a-Sunday-morning bias. The bottom line is that this model has its inaccuracies. With what I looked at and the way I looked at it, they seemed to be acceptable. In no way or form am I suggesting that it is perfect—and I’m certain that there will be objections and/or desired improvements out there—but in order to carry on from here I will use it as an evaluation tool for the catchers. For better or for worse. 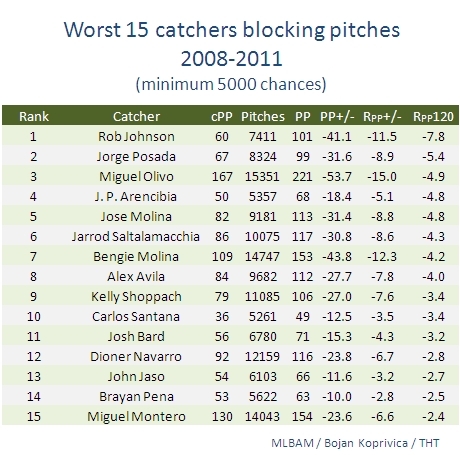 The swing between the best and the worst catchers seems to be about one win a year. 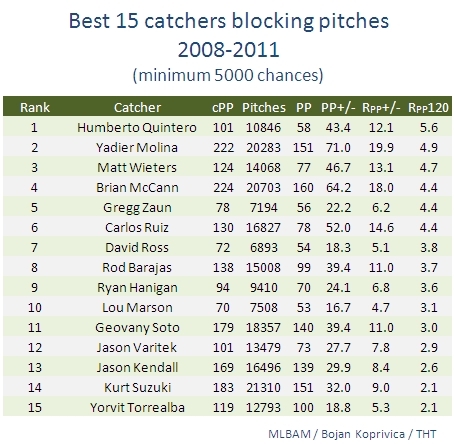 Or, put in absolute terms, over last four years Yadier Molina’s performance blocking pitches was about three-and-a-half wins more than that of Miguel Olivo. Recently, Mike presented his great research on catchers’ skills in framing pitches. 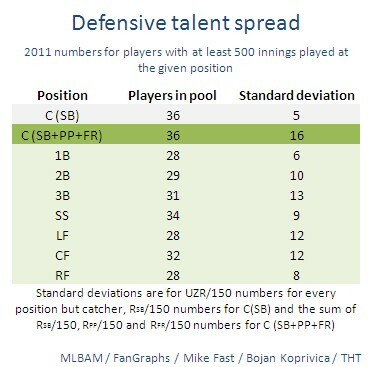 FanGraphs offers the data on the catchers’ abilities to prevent stolen bases. What if we combined all these numbers for 2011? We see the heavy influence of the framing component. 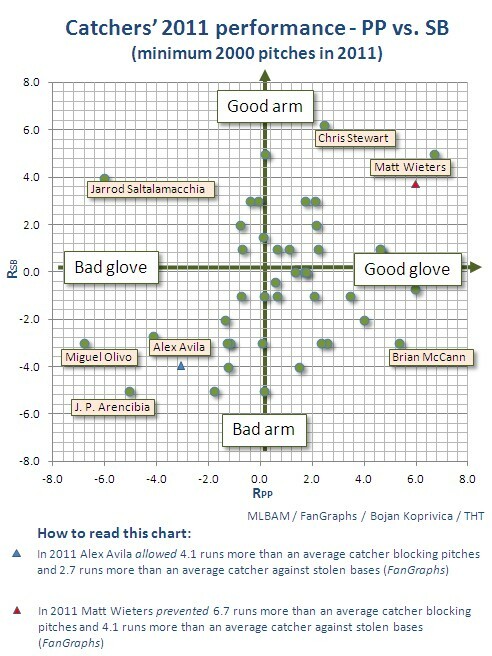 Alex Avila was below average both with his glove and his arm, yet he more than made up for it with the framing part. Mike Napoli lost his overall lead, but—for those of you counting at home—he was still five-and-a-half wins better than Jeff Mathis. Or, perhaps, previous steps? There are at least two other researches on this topic. Dan Turkenkopf wrote about it more than three years ago and Dave Allen took a similar approach as I did back in 2009. When I started my work, I was aware of the former, but not of the latter. Before you start asking me whether I’ve been living under a sabermetric rock or on a deserted island, let me preemptively admit—I did grow up on a small Mediterranean island that, by most standards, could be considered pretty deserted. So, I have that working for me. It took me a while to realize why the relative PP percentages went down in the last three rows. When there are runners on first, first and second or on every base and the count is already three balls, a passed pitch that was not swung at will be masked by the runner advancing on base on balls. 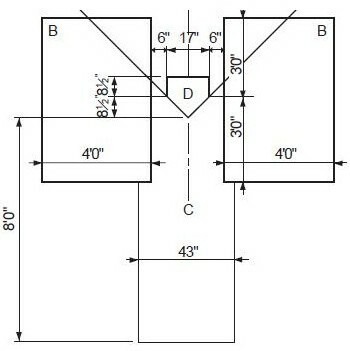 I’ll implement that into the model, but I do not expect any significant changes out of it. 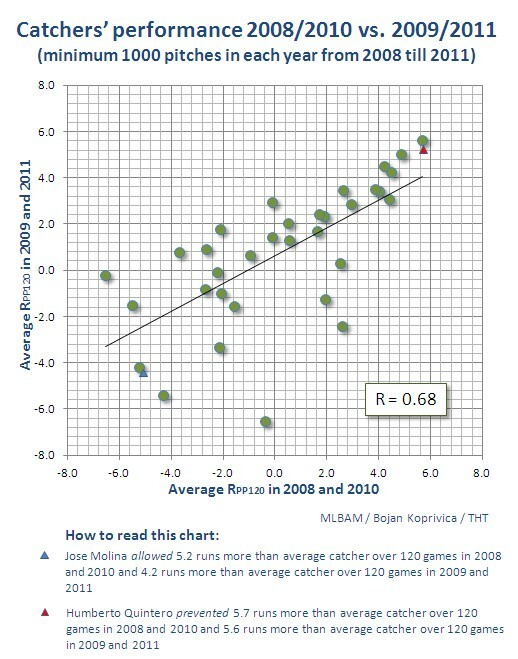 The other thing we can see from this chart is that pitchers throw tougher pitches to block when they are ahead. So, a possible further step would be to look at the whole issue from the pitchers’ side. Are pitchers more likely to go for the strikeout by bouncing the curveball in the dirt when they have a good blocking catcher? Is it quantifiable? And, you know, you could always go discover Jovanotti’s music. Bojan Koprivica played soccer in the USA and baseball everywhere else. While some use this fact to question his competitiveness, he talks of it using expressions like "international flair". Need to re-read to capture it all, but at first glance this looks phenomenal. Poor Saltalamacchia. But learning just how much catching Wakefield hurts him was worth the read, for sure. Excellent work. Bravo. what a great article. Thank you. Marc, yes, Salty is just a tad below average in blocking everybody else, but he is epically bad against the knuckleball. This is a fabulous article, Bojan. Very well done. Very thorough, well modeled, and presented very clearly. Amazing stuff here. Awesome work. Best article I’ve read in awhile. Get any calls from MLB clubs yet? Notice the difference between Yadier and his brothers. The reason is Mike Matheny – whose career was significantly shortened because he blocked every ball like it was the 7th game of the world series. 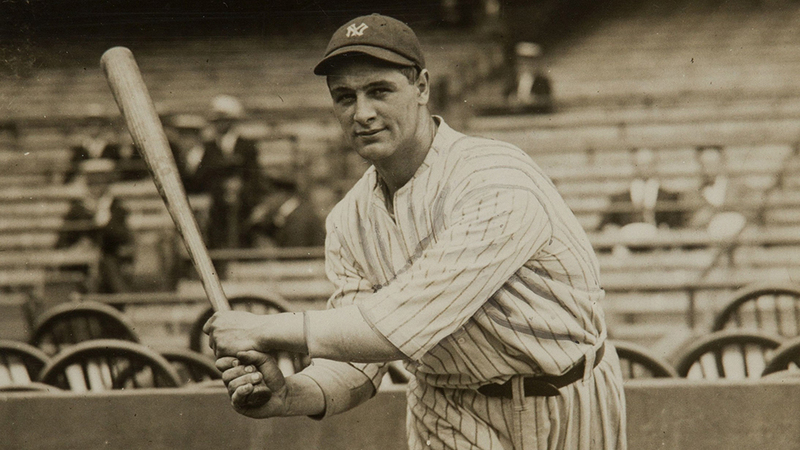 He threw his whole body in front of the pitch, landing directly on his knees and then bent over the ball with his body, closed the 5 hole with his glove and SMOTHERED any bounce. 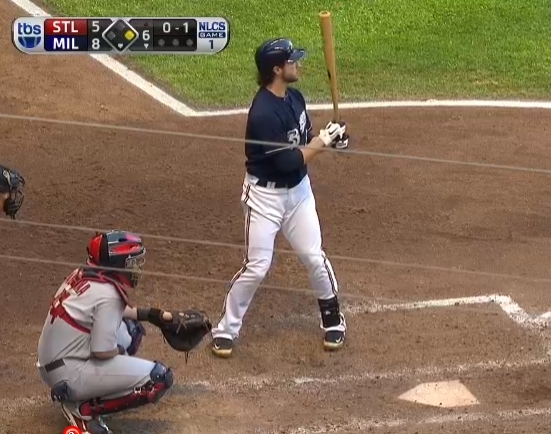 During the season Molina does this in critical situations – every couple games. In the post season he has done this 3-4 times a game. Curious, where would Posey end up? or is his sample size to small to get any really good indication of how productive or unproductive he is? So many variables to consider in this particular defensive skill. What is amazing is the fact that these guys make the hard stops look routine, and actually glove most of the damn things! Don’t forget the obvious one- a coach puts his best guy out there with the wildest pitchers. Buster Posey ranked 21st out of 64 catchers with at least 1000 PP opportunities in 2011 (with 3.2 Rpp/120) and 23rd out of 67 in 2010 (with 2.3 Rpp/120). Over those two years he amassed some 4,500 chances, so if you are looking for true talent, your best guess is regressing him some 40% to the mean. This is wonderful. Not just the data; I enjoyed your writing as well. I see that you examined which bases were occupied, and the count. It left me curious whether the number of outs made a difference. Thanks again for doing this and for sharing it with us. 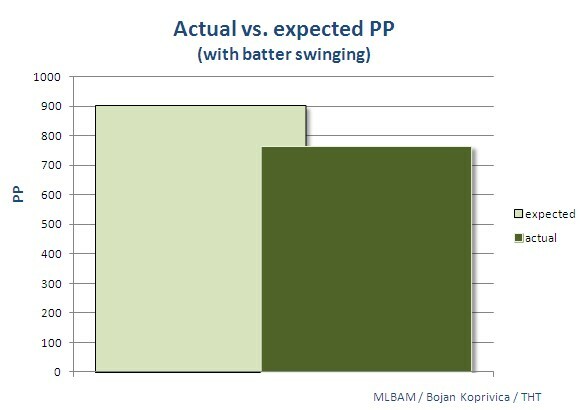 One idea on swing vs no swing: batters are more likely to swing at balls that are easier to block? Unless you already accounted for this. 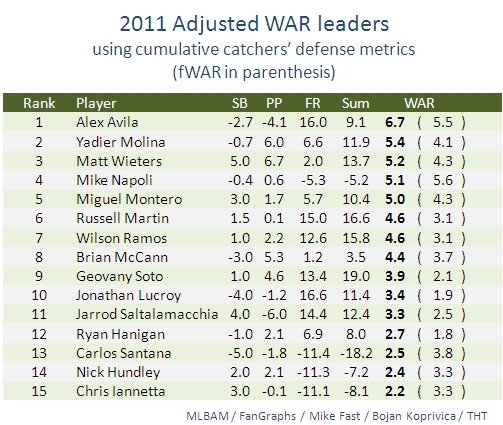 Atul, if you refer to the adjusted WAR rankings, he is not included because he only caught 408 innings this year. Scooter, thanks. I can have a look at this. Eric, thank you. The other factors are already accounted and controlled for when looking at the swinging influence. Great work! You had me at Rob Johnson -7.8. Thanks so much for sharing your hard work, Bojan. In my fantasy world, Mike Scioscia finds this article on his desk tomorrow morning and Mathis is DFA’d by Friday. This is great; and appears to have taken an immense amount of work. One thing that could be an improvement, however. It’s very clear that the catcher (and his mitt) is not always positioned directly behind the centerline of the plate. They move left and right to put their mitt/person WHERE THE PITCH IS EXPECTED. 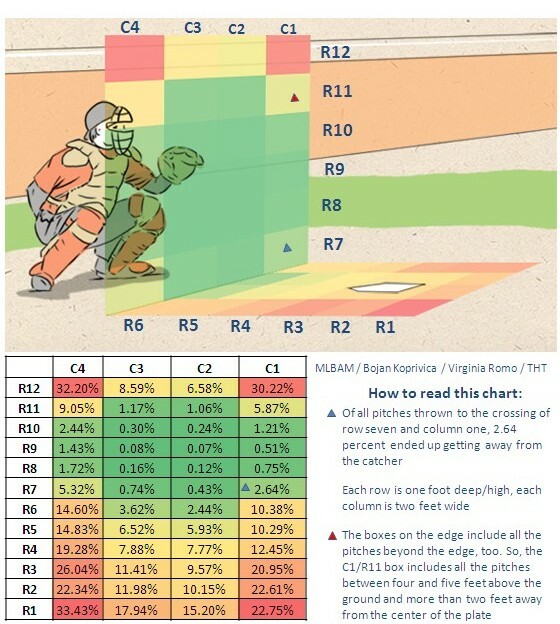 Essentially, the C1-C4 changes depending where the catcher and pitcher have decided to throw the ball (in/out). I shudder to consider how much work it would be to account for that. Thanks and you are absolutely right. 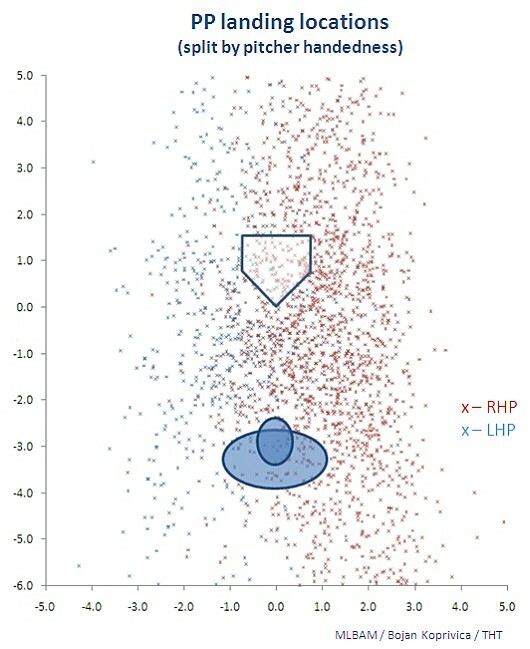 What this model doesn’t account for is the “element of surprise”, such as a pitch inside when it should be outside, a fastball instead of a curveball and such (not that a pitch 10 feet in front of the catcher is not a “surprise”). I am afraid you are also correct on the difficulty of implementing it into the model, at least with the data that is publicly available to me right now. great post for THT and glad you shared with AN. just fantastic. Can I start calling you ‘Bro’jan? Great work! This answers a question that’s been around for a long time. Once question, though: if we throw out Wakefield for 2011 (both easy to steal on and hrad to catch), where does Salty end up, i.e. what’s his true talent, non-knuckleball division? Brandon, I don’t have the “making of” numbers for throwing out baserunners, so I can only go with the final number that FanGraphs offers. Sorry. So, without having to worry about Wakefield’s knuckleball, Salty appears to be perfectly average in blocking pitches.